BILLINGS, Mont. – World leader Jose Vitor Leme is one of the most studious bull riders in the locker room. The semi-pro soccer player-turned-bull rider normally has copious amounts of notes for each bull in the championship round. Leme tries to educate himself on each bull’s tendencies so that he knows what to expect when it is time to nod for the gate. But he didn’t have many notes for Heartbreak Kid, and even if he had, they probably would not have done him any good on Sunday afternoon. Heartbreak Kid demolished Leme in a brief 1.69 seconds inside Rimrock Auto Arena, sending him crashing over the front end during the championship round of the Billings Invitational, presented by Cooper Tires. The 6-year-old bull is now a perfect 31-0 on the premier series and has 51 consecutive buckoffs at all levels of competition. The 2017 PBR World Finals event winner has squared off against Heartbreak Kid two times in his career, and neither has gone all too well for him. Heartbreak Kid had previously bucked Leme off in 3.23 seconds in Tulsa, Oklahoma, last year. H.D. 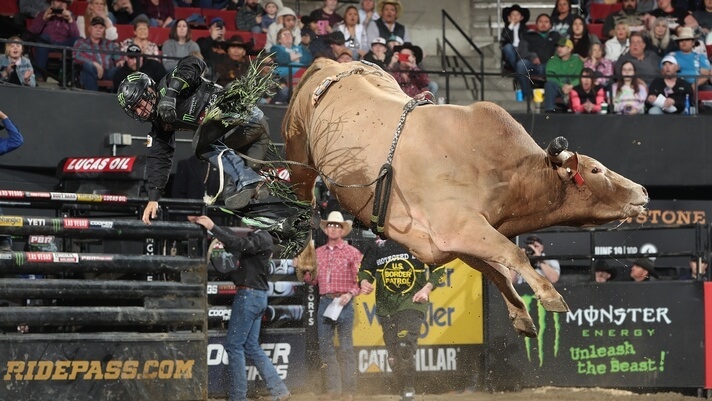 Page called Heartbreak Kid the best bull out in Billings on Sunday, which is saying a lot considering his reigning three-time World Champion Bull SweetPro’s Bruiser took home the YETI “Built for the Wild” bull of the event title with a 45.5-point score. Heartbreak Kid was marked 44.75 points. Heartbreak Kid is tied with Bad Touch for the most consecutive buckoffs among active bulls. They are one buckoff away from tying Rooster (32) for the fifth-most consecutive buckoffs in PBR history. Heartbreak Kid is the son of two-time PBR World Finals qualifier DaNutso and the nephew of SweetPro’s Bruiser. Leme (1-for-3) was the last rider in for the championship round courtesy of his 86.25-point effort on Catch My Drift and was left Heartbreak Kid as his reward. The 22-year-old bull rider was an injury replacement for Ryan Dirteater (bruised left buttock) in the championship round. Regardless, Leme was still no match for Heartbreak Kid. He becomes just the latest victim on Heartbreak Kid’s hit list. The two-time PBR World Finals bull has bucked off Leme, Cannon Cravens (3.01 seconds), Alisson de Souza (3.78 seconds), Silvano Alves (5.69 seconds), Lachlan Richardson (2.47 seconds), Jess Lockwood (6.7 seconds) and Cody Nance (3.72 seconds) this season. “He sure is a bull that no cowboy wants to ride,” Leme said.